I've realized recently that wherever I've lived, I haven't taken enough advantage of the wonderful places in those areas. In Michigan, I never made it to Traverse City, for example (which is apparently like a delightfully mild Caribbean town in the summer months). In Virginia, I never visited the famous Appomatox courthouse (which was just down the road from my alma mater). And in Missouri, I never once went to see Yakov Smirnoff's comedy show (which, may or may not end up having been a #win on my part). When I traveled back to Virginia this past time, I knew I had to do knock a couple things off my "things I should have done in college" list. 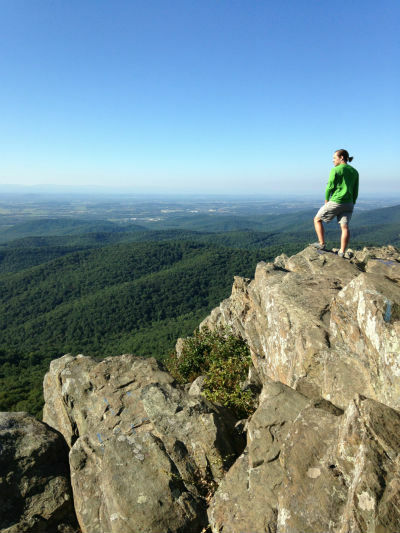 I decided that at the top of that list for Virginia was to hike a few sections of the Appalachian Mountains. So, I teamed up with a dear friend, and old roommate, and headed to the mountains. We headed for the eastern end of the Blue Ridge Parkway and hiked up to Humpback Rocks—a gorgeous outcropping of boulders that stick out like the spine of the mountain. The ensuing view is 200 degrees of incredible. We took in the general splendor, but when it was time to go, we knew we hadn't enjoyed enough beauty of nature yet. So, we got back on the Parkway and drove approximately forty miles west, southwest. Eventually, we found our way to the trail for the summit Cold Mountain (Cole if you search for it on Google). The sun was going down very soon and we wanted the sunset, so we asked four delightful older friends sitting in a circle around a fire if they knew how to get to the top. As the two men in their sixties were the men responsible for mowing the achres of land atop Cold Mountain, they certainly knew the way, telling us that if we hoofed it, we could make it up in 15–20 minutes. We ran, and made it up in 12. The peaceful sunset slowly gave way—the full greens gradually shifting to oranges and then to deep blue dotted with stars. It was a wonderful evening, and day altogther. The experiences on that day not only wonderful events in-and-of themselves, but having crossed a couple things off my list felt freeing. In a healthy, wonderful way, I'd come back to experience Virginia again, yet in a new and beautiful way, and oh, it was indubitably worth it.